High-powered weapons you can buy with your groceries. When Adam Lanza entered Sandy Hook Elementary School on Friday, inexplicably bent on ending as many lives as possible, he was carrying a Bushmaster AR-15 assault rifle and several high-capacity magazines. Although it is not clear yet where the AR-15 used by Lanza (which was registered to his mother) was purchased, the model is familiar to many shoppers at Walmart. It’s on sale at about 1,700 Walmart stores nationwide (though the retail chain pulled the weapon from its website early this afternoon), along with other guns of questionable use for duck hunting. Which other assault weapons can shoppers pick up at their Walmart? Colt’s M4 Ops .22 rifle carries a thirty-round magazine, which you can also purchase at Walmart. This Colt semiautomatic rifle comes with high praise from one Walmart reviewer: “I am a former Marine and this is just the same as the M16 but for the AUTO, never used AUTO that much in the Marines anyway.” That’s reassuring. When James Holmes killed twelve people and injured fifty-eight others in an Aurora, Colorado movie theater, he was carrying a Smith & Wesson M&P15 (another in the AR-15 class of weapons) and a Remington 870 Express Tactical shotgun, along with two handguns. There are also 381 types of ammunition listed on the Walmart web site. 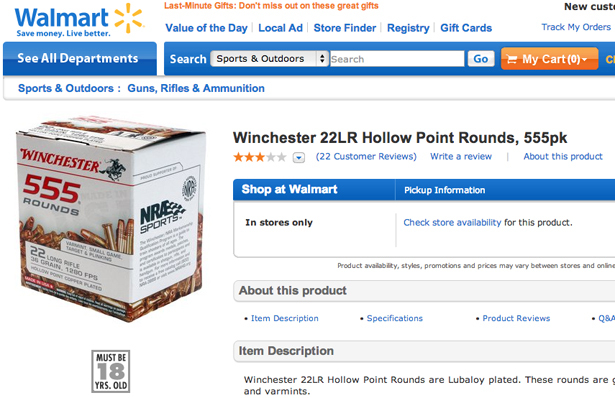 You can buy a 555-pack of Winchester hollow-point bullets, which the Walmart website advertises as “great for plinking and varmints,” but which would cause extensive damage should they enter a human body and expand, as they are designed to do. How are local activists pushing back against the biggest seller of firearms and ammunition in America? Read George Zornick’s article, How Walmart Helped Make Newtown Shooter’s AR-15 the Most Popular Assault Weapon in America, ;to learn more.